Smoke BBQ is a relative newcomer to the Holy City, opening its doors in the Summer of 2015 and leading what is becoming an influx of new BBQ joints to downtown Charleston. Smoke has its beginnings in the food truck scene, but it has set down roots at 487 King Street in the old Motobar location. Upon entering, you immediately see that Smoke is one of those classic King St. spaces that is long and very narrow. The widest spot is in the bar section in the middle of the restaurant. Wall to wall, it can’t be much more than 15 feet there, while most of the restaurant feels a comfy 10 feet wide at most. My estimates could be off, but probably not by much. There is a foyer area as you enter, followed by a galley of 3 or 4 tables on the right and a few round, high top, two-seater tables on the left. The bar area takes up the midsection of the restaurant, followed by additional seating at the back. We made it to the front edge of the bar and were greeted by a friendly bartender who told us to help ourselves to a seat and she’d be right with us. We grabbed the closest high-top, just at the end of the front half of the restaurant. Shortly, the bartender brought us some menus and took our drink order: beer for each of us. While we perused the menu, we could overhear the people at the table next to us speaking highly of their meal. One of them basically said some other BBQ place (didn’t catch the name) couldn’t hold a candle to Smoke. They also spent some time talking to and complimenting whom I believed to be the owner or manager. Interestingly, the owner/manager looked our way, making sustained eye contact a couple of times. “No way…” I responded. “Why would he?” And that is all I thought of it. The bartender returned, and we placed our order: Sampler Platter with two sides: fries and mac and cheese. I added an additional side of collards and expanded the meats offering by adding the optional 3 wings to the plate. In the interim, Heather noticed the owner talking to the bartender about us, and a bit later a serving of Smoke’s Loaded Hash Fries arrived. But I still wasn’t convinced she was right. Now, to our knowledge, we’ve never been recognized at any place we’ve dined, but then the manager/owner stepped over, put two shot glasses on the table and offered us each a shot of their Cinnamon Whiskey. So… the point of this little story is that we think the folks at Smoke did, in fact, know we write this silly little blog and did the smart thing and tried to make us feel welcome. We could be completely wrong, but it certainly felt that way. Kudos to them for being on the ball if that was the case, but we’ll not let that color what we have to say about our visit. Sidenote: If it was true (and, btw, we were not charged for the shots or the loaded fries), I am not sure of the proper etiquette on our part as reviewers other than to let you know. We accepted the gifts graciously, but with some uncertainty. As always, good or bad, remember our reviews are typically based on one visit and are simply our experiences and impressions. We don’t think of ourselves as experts, just a typical family who likes BBQ. Note also that if the good folks at Smoke knew it was us, it is possible that we may have been served a more select product than their typical customer…but maybe not. Who knows? So, while I’ll tell you exactly what we experienced, take it with a grain of salt. The Loaded Hash Fries are pretty much fantastic. The fries appear to be hand cut, leaving the skin on, and are seasoned with what I would guess are black pepper flakes prior to cooking. These nicely fried potatoes come mounded in a long pile and are covered with a brisket hash and a trio of sauces, sprinkled with a spice mix, topped with pickled jalapeños, and garnished with additional pickled vegetables. “It had pickled cucumbers, onions, carrots, and jalapeños,” Heather remembered. The hash didn’t stand out to me. I say that not because it wasn’t good, but because it was served in a way that the hash itself wasn’t the star of the show. It was simply one of many ingredients. Certainly, it is not the hash most South Carolinians have long known. “I couldn’t tell you what the hash tasted like,” I stated later. The pickled jalapeños, on the other hand, were an excellent addition, providing subtle heat and tang while also cleansing the palate, as did the other pickled veggies. Enough said. Order it. I can’t imagine being disappointed. Next, the cinnamon whiskey shots arrived. Frankly, I’m not much of a drinker to begin with, and I truly don’t care for the burn of straight alcohol, so I had my doubts, but what’s one to do with a complimentary shot but throw it back? Now, I don’t know what they did with these shots, but there was no raw alcohol taste. It was very clean and fresh-tasting, and there was none of the burn you might expect. Not being a drinker, I probably wouldn’t order them from the menu if we were to dine at Smoke again, but not because they weren’t good. “It was pretty tasty,” I said. “I love cinnamon,” Heather raved, and added that “we were told that it would refresh our palate for us to start to eat.” And so it did, pleasantly. After a short wait, the sampler platter arrived along with the extra wings and each of the three sides we ordered: fries, mac and cheese, and collards. 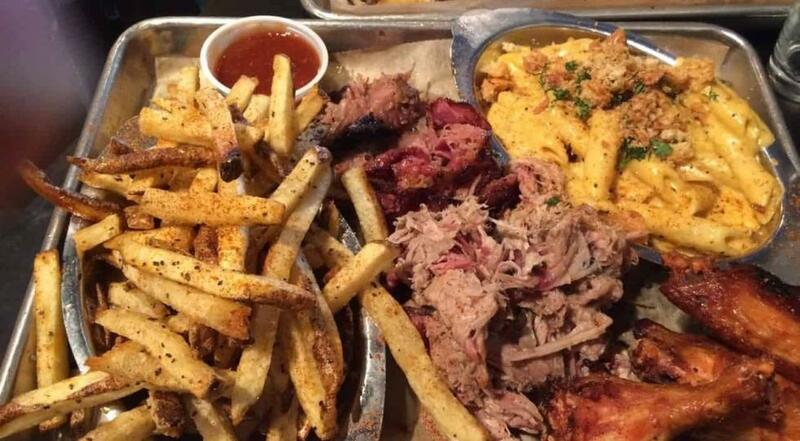 The platter typically comes with pulled pork, brisket, house-made pastrami, and smoked chicken confit. We knew before we placed the order that they had sold out of the chicken. As a result, the bartender/waitress promised they would add additional meats to the plate to compensate. “Confit” (French: sounds like “kon-fee”), by the way, is a cooking/preserving technique that results in amazingly tender meats. Learn more about Confit here. We’ll start with the pulled pork. There was a lot to like about the pork, but it falls short of perfect. I agreed. The pork stood on its own in terms of flavor. The texture, however, was a bit soft. If you sit at the novice table at an SCBA competition, the Master Judges will teach you how to test for texture: Take a strand of pork and pull gently. There should be a bit of resistance and the meat should break gently, leaving a clear break in the middle. Hard to describe in words, but suffice it to say Smoke’s pulled pork would not have met that standard. But, keep in mind, that texture is only one of many factors upon which to judge BBQ, and in many other categories the BBQ we sampled would have stood up well, with or without sauce. As for the sauces, Smoke offered us two: a red and a mustard. “I liked the red,” Heather said later. The red was well done and probably the better of the two, but I think we were most impressed by a third “sauce,” of sorts, that made it to our plate: the ketchup. Not a lot of places make their own ketchup. It seems that Smoke is one of those that takes the chance and pulls it off. We were first introduced to a house-made ketchup back in the early ’90s. There was a little shack of a place on John’s Island that was just fantastic. I cannot recall the name, but it later became the Fat Hen. (Maybe the name never changed, just the location?) Ironically, at the time, I’m pretty sure it was in the very building that now houses JB’s Smokeshack (now closed). Anyway, they made their own ketchup back then, and it was special. Smoke BBQ’s ketchup may not linger in my mind 25 years from now, but that is no comment on its quality. Smoke smokes tomatoes and uses those to make their ketchup. If you are a Hunt’s or Heinz devotee, you may not appreciate the effort, but you should. The pastrami was what I was looking forward to the most. I love pastrami (and corned beef), and will almost always order a Pastrami on Rye or a Reuben if it is on the menu, so I was looking forward to trying what Smoke had to offer. I was not disappointed. “The pastrami was the best,” Heather announced. “Pastrami was pretty amazing,” I agreed. “It was actually kind of crispy like bacon. Quite tasty.” I thought the crispness of our pastrami was unusual, but it worked. The brisket, however, was far from crispy. It was moist and tender, as brisket should be, but it probably finished third among the meats. In the end, honestly, the brisket was the least memorable of the three primary meats. The wings, however, are hard to forget. They have a nice smokey, golden brown exterior which yields to a juicy, flavorful interior. I believe these are cooked in the confit style described above, and the extra effort pays off with a wing that is tender and definitely worth ordering. As for the sides, nothing but good things to report. First, the fries were fries, as described above. Hard not to enjoy a fried potato, especially when you can dip it in an excellent ketchup. “The mac and cheese was fabulous,” Heather said. And she was right. The mac and cheese was creamy and thick and cheesy and delicious. The pasta was more of a penne than the eponymous macaroni noodle for which we know the dish, but the side certainly didn’t suffer for the substitution. The crunchy bread crumb topping was nice in contrast to the smooth, creamy pasta. Definitely one of the best mac and cheeses we’ve encountered among the many SCBBQ houses we’ve visited. If you’ve read this blog more than once, you know I will always order collards if they are on the menu. Our visit to Smoke was no different. Collards typically come in one of two ways: sweet or savory. The old Southern standby is collards tossed into a pot of water with a smoked ham hock and an ample helping of salt. Many places today, add additional layers of flavor, with broths, vinegar and sweeteners added variously to the mix. Smoke BBQ adds the additional twist of carrots. The carrots, while a nice visual contrast with the greens, neither added nor detracted noticeably from the dish. I enjoyed them along with the tender and flavorful collards, which I would order again. Finally, a note about the pickles which accompanied each plate. “The pickles were pretty phenomenal; the onions were the best,” Heather said. And I agreed. As mentioned above, they are basically on the plate to help cleanse the palate and offer a balance to the natural fattiness of the BBQ, but they were more than utilitarian additions. I could be wrong, but each seemed to be pickled differently, with the jalapeños having an almost sweet bread and butter treatment while the cukes seemed more dilled. Regardless, they were elevated above the role of garnish and were appreciated by these two diners. Our review of Smoke BBQ on King St. in Charleston, again, was a one-time experience, but it was certainly one that we enjoyed. Give them a shot (no pun intended), and we’re confident, you will, too.